Address: 18 King William St, Adelaide SA. 1931 Series (Income Tax) 1/- R4. Background: Goldsbrough Mort & Co Ltd is the oldest wool brokers in Australia but it is descended from the businesses created by two Wool-trading pioneers, Richard Goldsbrough who started in Melbourne in 1848 and Thomas Mort who started in Sydney in 1843. 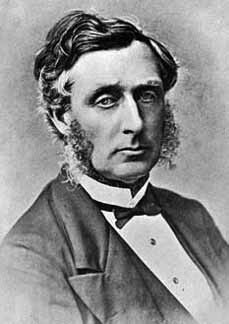 Richard Goldsbrough (1821-1886), wool broker, was born on 17 October 1821 at Shipley, Yorkshire, England, the only son of Joshua Goldsbrough, butcher, and his wife Hannah, nee Speight. In 1842 he completed a seven-year apprenticeship in near-by Bradford, set up in business in that city and married Emma, daughter of Samuel Hodgson, a Halifax butcher living in Ovenden. His business as a wool-stapler was small but prospered modestly. His success depended partly on the skill with which he sorted and repacked purchased wools to meet the individual requirements of different manufacturers. With this skill he decided to move to Australia and arrived in Melbourne aboard the “Warrior” on 29 November 1847 and founded his business in September 1848. His wife Emma remained in England until at least 1850. At first Goldsbrough's main business was in classing and repacking wool for growers, and in classing sheep on properties. The purchase of J. & R. Bakewell's business in 1850 made Goldsbrough the leading broker in Melbourne and he commenced the first regular auction sales of wool in the colony. From 1852 Goldsbrough was assisted by his brother-in-law, Hugh Parker, with whom he made a formal partnership in 1857. By that time Goldsbrough had entered other branches of the wool trade and industry. With Edward Row and George Kirk he formed the firm of E. Row & Co. in 1853; it became Row, Kirk & Co. in 1860. The partners acted as auctioneers at Goldsbrough's wool sales and developed a large clientele as stock and station salesmen. After the partnership dissolved in 1863 Goldsbrough's own firm began selling stock and stations. In addition Goldsbrough made many private speculations in pastoral properties and he was also a partner in, and probably financed, the hide and skin business operated by close relations of Frederick Row and Parker. The wool broking partnership was strengthened in 1873 by the addition of John Horsfall and David and Arthur Parker in 1876. By the 1860s wool classing and packing were minor among Goldsbrough's services; selling wool in Melbourne, consigning it for sale in London on behalf of growers and providing short- and long-term credit for pastoralists were the major elements. Lending to squatters in central Victoria and the Riverina proved very profitable in the decade of squatting boom. At the end of the 1860's a pastoral depression reduced stock and station values, diminished income and a sharp fall in profits placed Goldsbrough at the mercy of banks from which he borrowed the money he lent. Bank forbearance permitted him to extricate himself but he had suffered heavy capital losses and this demonstrated the risk of borrowing short and lending long. To escape dependence on banks Goldsbrough sought to amalgamate with a public company having access to British investment funds. After unsuccessful negotiations with the Australian Mortgage Land & Finance Co. in 1874, he later merged with the Australasian Agency and Banking Corporation in 1881. Next year, after bidding unsuccessfully to purchase the business of Mort & Co. in Sydney, the new concern opened its own branch there. The amalgamation creating Goldsbrough Mort & Co. Ltd was not carried through until 1888. Goldsbrough had begun to withdraw from active management of the firm as his health was failing and he died on 8 April 1886. Few of his children had survived and he named his heir to be Richard Goldsbrough, son of Frederick Row's wife Elizabeth Selena. The name is confusing but was the result of Goldsbrough’s friends and business associates christening their children with elements of Goldsbrough’s name. Thomas Mort was born at Bolton, Lancashire, on 23 December 1816, he was the second son of Jonathan and Mary Mort. Jonathan was a master cotton weaver who had inherited his father’s mill, but he later sold the mill and moved his family to nearby Manchester. Their Thomas and his brothers received a sound education and mixed with the well-to-do sections of Manchester society. Thomas initially worked for the Manchester merchant firm of A. & S. Henry but heard of a similar position becoming available in Sydney and decided to take it. Mort arrived in Sydney on the “Superb”, on 25 February 1838 and started work immediately as a clerk with his new employers, Aspinall, Browne & Company (which later became Gosling, Browne & Company). He remained with that firm until he left it suddenly in 1843 to establish of his own business. Mort chose the business of auctioneer because it required little capital yet offered steady trade, good profits, and little risk. His decision proved correct as in the next five years he did well with sales of, books, furniture, importers’ stocks, groceries, spirits, land, stock etc. increased rapidly. Yet there were quite a number of well-established auctioneers in Sydney and Mort knew that he needed to do something special to attract attention to himself. Consequently, in October, 1843, he announced that he would hold weekly auction sales of wool. The auctions went well and in about 1849, Mort decided to auction stock and stations as well. This too was a new practice, for auctioneers had not been able to provide buyers with the credit they needed. Mort overcame this by lending his own money and money he borrowed from capitalist friends and banks. Then in the early eighteen-fifties he began consigning wool to the London sales for growers. These additions to his business completed an integrated set of services to the wool industry which set the pattern for the later wool broking firms. They meant that Mort financed the purchase of stations and acted as salesman, that he provided finance to operate and improve them and facilities for the sale of surplus stock, and that he sold, or consigned to England, the wool and tallow produced on them. On 1 January 1850, Mort took Alexander Campbell Brown into partnership, the firm being known as Mort & Brown. This partnership lasted only three years. At the end of 1855 a new partnership was formed to run the wool sales. Mort & Company consisted of Mort, his brother Henry, and John Valentine Gorman, the auctioneer, and later Ewan W. Cameron. 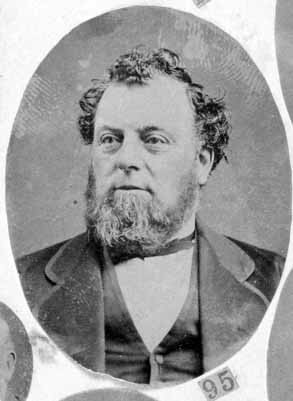 In 1860 Benjamin Buchanan was admitted to the partnership. In 1867, when E. W. Cameron retired, a new partnership was formed consisting of Mort, Henry Mort, Benjamin Buchanan, and Mort’s son Laidley. After Mort died in 1878, the business was managed by the Hon. Henry Mort, M.L.C., Laidley Mort, Benjamin Buchanan and Joseph P. Abbtt; it was they who agreed to the amalgamation with Goldsbrough in 1888. As the economy slowed, the company had experienced the same credit issues that Goldsbrough had experienced in Melbourne and to address this Mort created his own loan company T S Mort and Company to cover these services. The company weathered these financially difficult times largely with the resources of Mort, his friends and other investors. Through growth and acquisition Goldsbrough Mort became the largest wool broking operation in Australia with branches in all States. 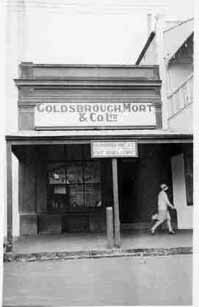 Device: Goldsbrough Mort was a very large company that had their roots in Melbourne and Sydney but in time grew to have State capital offices, wool stores and regional offices across Australia. Interestingly they only chose to use perfins in their South Australian operation. In 1924, Goldsbrough Mort acquired the large South Australian stock and station agents, Bagot, Shakes and Lewis. Bagot, Shakes and Lewis were perfin users and the company had existed since 1888 although they did not start using a perforator until about 1912. It seems that despite the take over the use of perfins remained the policy of the SA management of Goldsbrough Mort. At this stage the GMCOLTD (1929-30) patterns and the GM (1936-37) patterns have not been reported on revenue stamps, but logically they should be found on these issues as their use is within a period from the late 1920’s until 1940 in which revenue usage is found. All revenue use by this user is rare and the GMCOLTD (1929-30) and GM (1936-37) devices had very short usage periods. 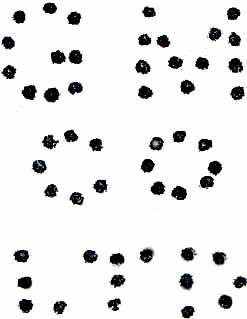 All of these patterns are confirmed to be from Goldsbrough Mort and used at its Adelaide office at 172 North Terrace. 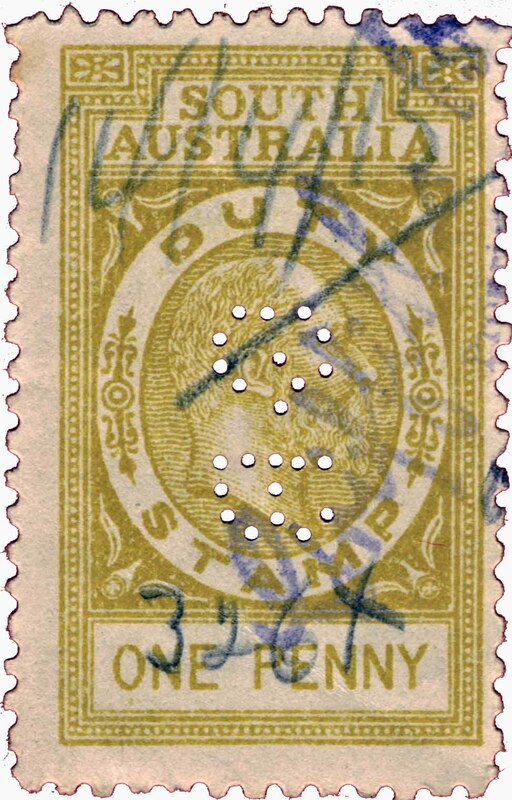 But the company also had a large wool store at Port Adelaide and the pattern is found on stamps with a range of remote postmarks from Cowell, Port Lincoln, Hawker, Mount Pleasant, Loxton, Murray Bridge, Jamestown, Riverton, Kongolia, as well as many others. These remote usages are consistent with the network of small buying offices and agents that the company was known to have around South Australia. This device was a two-die device in a vertical array and it is found used over the period 1937 until at least 1940. The G.a and G.b device is a modification of the earlier GM (1936-37) device as the devices share pin locations of the G and are of the same format. 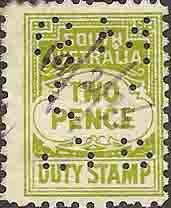 The GM device had been created to make central strikes in the KGV issues of the mid 1930’s but in May 1937 Australia issued a series of smaller format stamps in the first of the KGVI definitive issues. The company responded by altering their GM device by removing the M’s to create a two-die device with two G’s which is G.a and G.b. The G.a and G.b device was not used passed 1940 and at this point the company ceased perforating their stamps. Device: The GB.a device was most likely a single die device as the strikes that we have seen are all identical and we can find no evidence of consistently related strikes. Address: Glenfell St, Adelaide SA. Background: *Charles Goode (later Sir) was born in 1827 in Herefordshire, England. In 1837 he left school and 2 years later he was apprenticed as a draper. In 1849 (aged 22) he migrated to South Australia where he opened a shop in North Adelaide as well as selling goods on foot and later by cart. When his initial partner Thomas Good retired he joined with his brothers Samuel and Matthew in opening a warehouse in Adelaide. 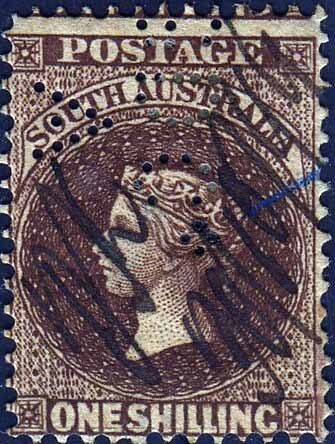 In 1859 Charles went to London to establish a buying department and did not return to Australia until 1863. After a short period in politics in the seat of East Torrens in the House of Assembly he returned to London and conducted the business from they’re until 1882. At this time the partnership with his brothers was dissolved and he returned to Australia and created a new company with new partners W. H. Durrant, (his London manager) and W. H. Tite. The company was publically listed in 1893 and Goode remained a director but he had other interests, including a Directorship in a Bank, an Insurance company and several manufacturing concerns as well as the newspaper the South Australian Advertiser. The company expanded from its base in Adelaide across to Perth were they had premises at 39-41 William Street, Perth but also at the Lion Boot Factory, Subiaco, and offices in Kalgoorlie, and Broken Hill (NSW) and a London office at 27 Milton Street London EC. Charles was knighted in 1912 and he died in 1922 aged 95. In 1934 Goode, Durrant merged with D & W Murray to form Goode Durrant & Murray Ltd, which continued to be run from offices in London. The company was in turn taken over by D & W Murray (Australia) Limited in July 1957. Device: The GDCO/A.a device was a single die device and it was known to have been manufactured by Slopers in England in 1896. The device was part of a larger order which had been placed by Goode Durrant and Co which also included the GDCO/P device. (see WA listing) The “A” device was for the Adelaide office and the “P” device was for the Perth office. The GDCO/A.a device was used over an extensive period from at least 1897 until as recently as 1960. This usage is almost exclusively on postage stamps and revenue usage is rare. Device: See G.a, G.b for summary of Goldsbrough Mort patterns. The GM/Co/LTD.a and GM/Co/LTD.b is the second two-die device used by the Company and it was two dies in a vertical array. It had a usage period of about 5 years from 1930 until 1935. The two dies are rather similar but they vary in many pin locations in particular the structure of the top of the T and the D in LTD.
1935 usage does show some blind pins but otherwise the device seemed to be sound at the end of its usage. This is a single die device and we have sighted examples of multiple strikes on joined pairs etc. and none show any consistent relationship between strikes. It was the first device used Goldsbrough Mort in the Adelaide office and is found used over the period of 1924-1928. 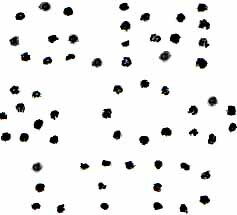 Previous studies of these patterns have featured inaccurate images which may have lead to miss reports between this pattern and the somewhat similar GM/CO/LTD.a and GM/CO/LTD.b patterns. Address: Stephens & Rundle Place, Adelaide SA. 1927 Series 6d R4, 10d R4. Background: *The company that was to become Good, Toms and Co was formed in London in 1872 and the business soon established a presence in Adelaide, (as early as 1877). The founding owner was Thomas Good (possibly the original partner of Charles Goode in the firm that was to become Goode, Durrant & Co) but later Samuel Toms joined the firm once it started in Adelaide, Toms having earlier worked for Goode Durrant & Co. The partnership flourished and Good, Toms and Co became one of the leading wholesale drapers in the Colony. Good died suddenly in early 1889 but the business was well supported by both families who continued to operate the business. Samual Toms travelled to England in 1902, ostensibly for his heath and died there in July 1908. In July 1889 Good, Toms and Co took possession of their new premises at Stephens Place, Adelaide and by 1907 the firm had a branch in Broken Hill. The company continued under the management of Frank Toms and later his son Charles but following the start of the Great Depression the company was wound up in May 1931 and the property at Stephens Place sold to long term neighbours Charles Birks and Co.
Device: The GT/&Co.a device was most likely a single die device and it is reported on the postage stamps of South Australia and later on the postage stamps of Australia. The overall usage period is 1912 until at least 1930. 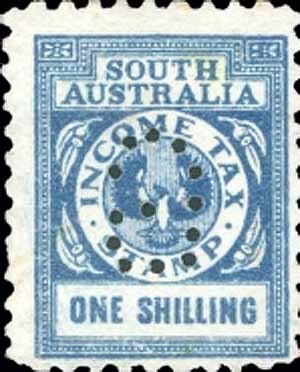 Like many South Australian patterns, usage on SA revenue stamps is very rare and the authors have sighted just a couple of examples. Late usage in 1930 show very poor strikes and these can often be just a series of pin impressions with few actual holes.